We will repeat the wording we included for our review of the Chef's Recipe Feta and Rosemary. 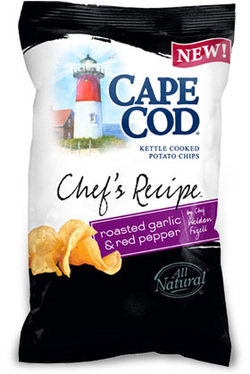 They were reviewed together so our opinion remained the same: Cape Cod's standard Kettle Chips bags are among the world's finest designs, with each one earning five stars on our review pages. The broad black colors of this special edition flavor do not work nearly as well. The color coded pack designs work really brilliantly, but as a 'New' option the Manufacturer clearly wanted these bags to stand out - they do, but the black overwhelms the design. They could have tried two colours. The crunch of these Chips was not quite as hard and brittle as most in the Cape Cod range, but they did have a lot of ingredients to contend with. The Snap Test worked well; the Chips cracked in half and the two halves remained whole, but they were sufficiently flavorful to almost expect food to bounce out of the Chip edges. These were a little darker than the Feta & Rosemary partner to this Cape Cod range of two. The reddish colored seasoning powder was found evenly coating the Chips in a fashion that it was absorbed as color of the Chip rather than visibly coating them. Most of the Chips were whole and with smallish bubbles, where the oil was presumably at the right temperature. There were some curled Chips and some folded over, but on the whole, they were thick and just right. Again, we will repeat a section of the write up from the Feta & Rosemary review: It is a little difficult to work out how the process would work. You get a chef and ask him or her for their most amazing Chips recipe, or do you just ask them what flavor they think would make a good Chip? After all, it is a stretch of the imagination to consider that a restaurant chef will know that you will need... Silicon Dioxide and Calcium Silicate to make a Roasted Garlic and Red Pepper bag of Chips. Indeed, how Garlic Powder translates into Roasted Garlic is anyone's guess. If a restaurant chef is capable of this sort of genius he should be able to wave a magic wand over Africa to feed 'em all! Anyway, getting away from the marketing game and back to the flavor - brilliant is a word we use fairly infrequently on these pages, but the roasted vegetable aroma that greeted us on opening the bag was followed by a tangy, zingy sweet pepper taste, which had some really comforting flavors brought out by the salt and garlic powders.